Making a Difference, Changing Lives. Fixing a burst 1000mm diameter asbestos cement pipe within 24 hours is part of the skills set required to successfully do the O&M of the Blyde River Water Distribution network. However, every now and again, the team is challenged with some less frequent jobs, like re-installing a 600mm flanged butterfly valve, where working space and access are very limited. The valve failed last year when its shaft bushings seized, and was removed for repairs, while a distance piece was installed. After refurbishment, it was time to put the valve back into its rightful place. Pre-shut preparations included sending out notices to all affected water users, and all bolts were loosened and re-tightened to ensure no delays on the day of the shutdown. Closing the affected pipe routes, and re-filling is by far the riskiest, and time-consuming part of such a major shut down, considering that more than 130 water users are depending on the pipe network for water. The valve was successfully installed, and downtime was limited to less than 24 hours. 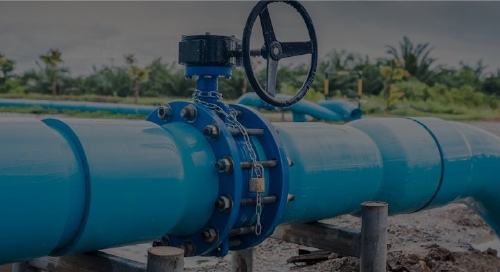 The next major shut down involves the replacement of a 700mm butterfly valve that will require the entire pipe network consisting of 125km of pipe to be shut down and re-commissioned. This is scheduled for June 2018. MBB is proud to have the skills set to tackle most major maintenance works required in house.